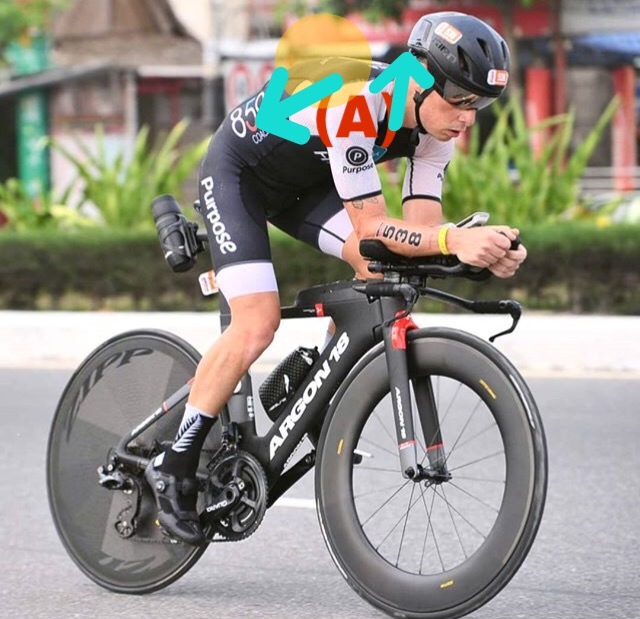 The yellow circle in the picture depicts a sharp hunch over the cyclist’s upper back. This indicates an area of excessive back flexion. The excessive flexion through his upper back can indicate an area of instability. This means that there is too much movement, namely the amount of bending going through this area. Weak shoulder muscles can cause excessive back rounding. One factor resulting in excessive flexion is poor usage of the shoulder blade muscles. Shrugging the shoulders back and down, via engaging muscles that do this, can reduce the amount of bending through his upper back and create increased compression and stability there. 1. On top of getting a backache, he will not be able to sustain the aerodynamic posture. By physical laws, this also generates a flexion moment causing his upper back to keep bending more and more. 2. If his shoulders remain rounded forwards, he will start using his accessory neck muscles for breathing and this strategy is inefficient. 3. A rounded back posture also means that he needs to compensate with an increased respiratory rate to maintain the volume of oxygen he needs. 4. The increased respiratory rate is going to unnecessarily speed up his heart rate, increasing demand on his muscles and tire him out faster. 5. When the upper back is rounded, passive expiration is not as efficient. This means that after taking in a deep breath, which is what you are trying to do when you are racing hard, you will find it harder to exhale fully, therefore causing you to end up having shortness of breath very quickly. 6. 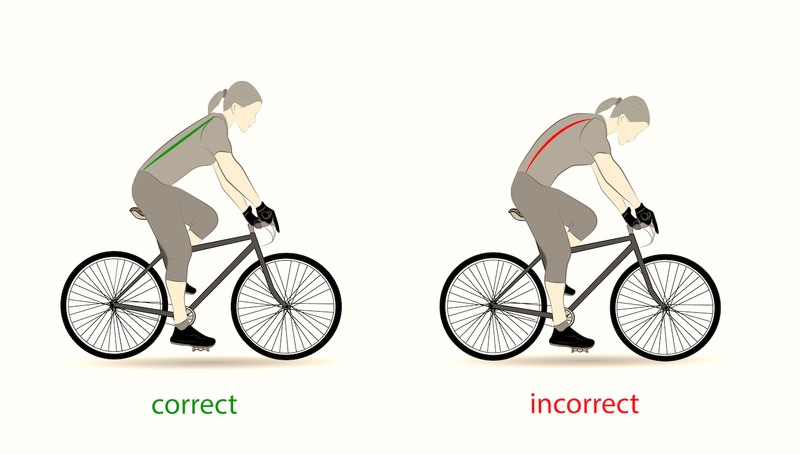 Also, excessive rounding at the upper back directs a net movement pushing you forwards and off the bike, causing you to slip forwards. This is not what you want as you want to be grounded to the bike and move with the bike. You do not want to be moving off the bike! Ying Rong is the co-founder and senior physiotherapist at The Rehab Lab. The Rehab Lab was established with the notion of providing evidenced based injury prevention and rehabilitation treatment methods. Besides managing the business, Ying is also very passionate in both road cycling and distance running. Over the 10 years in her cycling and running journey, Ying has won several accolades with the most memorable being her win at the 2016 Gyeongju Cherry Blossom half marathon. The same win saw her breaking the national half marathon record which was also recognised in writing by The Straits Times.